With the help of robot-assisted rehabilitation and electrochemical spinal cord stimulation, rats with clinically relevant spinal cord injuries regained control of their otherwise paralyzed limbs. But how do brain commands for walking, swimming and stair-climbing bypass the injury and still reach the spinal cord to execute these complex tasks? EPFL scientists have observed for the first time that the brain reroutes task-specific motor commands through alternative pathways originating in the brainstem and projecting to the spinal cord. The therapy triggers the growth of new connections from the motor cortex into the brainstem and from the brainstem into the spinal cord, thus reconnecting the brain with the spinal cord below the injury. The results are published in Nature Neuroscience March 19th. "The brain develops new anatomical connections through regions of the nervous system that are still intact after injury," says EPFL scientist Grégoire Courtine. "The brain essentially rewires circuits from the cerebral cortex, brainstem and spinal cord—an extensive rewiring that we exposed to unprecedented detail using next-generation whole brain-spinal cord microscopy." "The recovery is not spontaneous," says EPFL scientist and lead author Léonie Asboth. "You need to engage the animals in an intense rehabilitation therapy for the rewiring to take place. In our case, this therapy involves electrochemical stimulation of the spinal cord and active physiotherapy in a smart assistive harness." In Courtine's lab, rats with a contusion causing complete paraplegia learned to walk again via therapy that combines electrochemical stimulation of the spinal cord and robot-assisted rehabilitation. The rat's spinal cord is first stimulated with pharmaceuticals, then electrically stimulated below the injury to activate muscles in the legs. Combined with therapy in a smart harness that alleviates the body's weight, providing natural walking conditions, and after just a few weeks of training, the rats regained extensive control over their hind limbs at will, even without electrochemical stimulation or the harness. In 2012, Courtine and his team showed that rats with spinal injury could climb stairs and swim with neuroprosthetic rehabilitation. Comparing the brains of injured rats after rehabilitation with those of healthy ones, the scientists were able to identify the reticular formation, a region in the brainstem, as key in recovery. The scientists uncovered this role using optogenetics and chemogenetics in transgenic animals, an ensemble of precise tools that allowed the activation and inactivation of well-defined circuits in the brain and brainstem to probe their function. 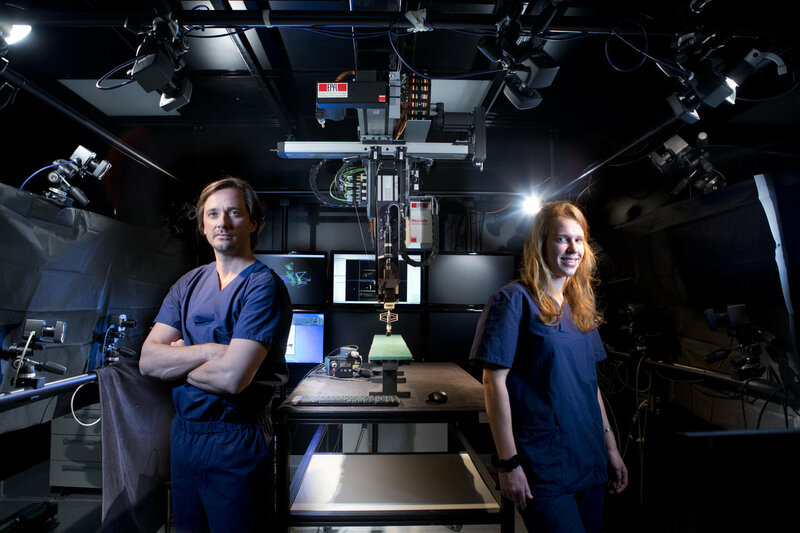 They also exploited a new, powerful light-sheet microscope developed by the Wyss Center for Bio and Neuroengineering in Geneva to visualize neural tracts. The entire central nervous system was rendered transparent, with the exception of the neural tracts that expressed a fluorescent protein. By passing a sheet of light throughout the non-sectioned brain and spinal cord, the scientists obtained previously unseen 3-D images that showed the organisation of neural tracts in healthy animals and how the therapy reorganised these pathways without any bias. The injured neurons do not regrow spontaneously, but a reorganisation of the neural branching occurs above the injury leading to new connections. It remains to be seen if neuroprosthetic rehabilitation in people leads to an analogous rewiring of the brain, brainstem and spinal cord. Courtine is optimistic: "We previously showed that plasticity, the remarkable ability of the nervous system to grow new connections after spinal cord injury, is even more robust in humans than in rodents. We are currently testing our therapy in people with spinal cord injury at the Lausanne university hospital (CHUV)."